In this article, I will demonstrate how to take photos of star trails when photographing the night sky. I will explain what type of camera, lens, and other gear is critical, as well as the importance of composition during dark nights; it is very important to know how the stars move on the sky to be able to visualize the final composition. I will also talk in detail about two main challenges: how to focus in darkness and how to set the right exposure. Along with that, the process of taking the photos is only first half of the creative process – post-processing is equally important for the final result. Even though the software post-processing will not be the primary focus of this article, I will briefly shed light on the basic principles. So, let us get started so that you know how to take amazing star trail photos the next time you shoot pictures at night. 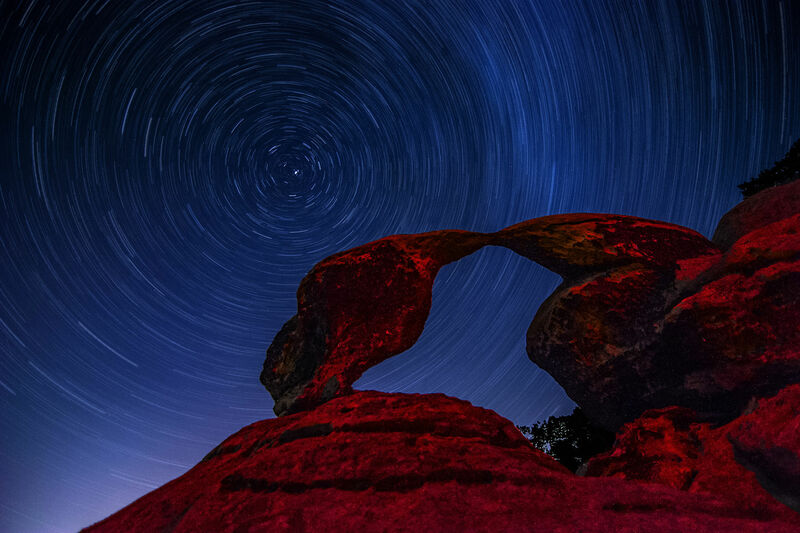 Read on to learn how to take star trail photos like this. How Hard Is It to Photograph Star Trails? With the technological progress of cameras today, modern DSLR and mirrorless cameras make it far easier than before to capture the beauty of the night sky. What had previously been possible to achieve only with scientific methods and very specialized equipment is now within the reach of everyday photographers with suitable equipment. We need to be clear about the different levels of complexity so that you know which photos you can take and which are beyond your reach. Some phenomena, such as deep sky objects, are very demanding on the knowledge, skills and equipment. Others, such as compositions with the Milky Way, are also tricky, but already manageable for many hobbyist photographers who (in ideal case) own a full-frame camera and a fast wide angle lens, or even those who own crop-sensor cameras. Regardless of your equipment, though, it is very important to photograph the darkest possible sky without much human-caused light pollution and minimal moonlight. High ISO performance, the speed of the lens (the maximum amount of light it allows to travel through – i.e, aperture) are the key indicators for success, especially if you want to capture pin-sharp stars. The main challenge to be tackled is the movement of the earth, which (from the perspective of the photographer) results in rotation of the night sky. 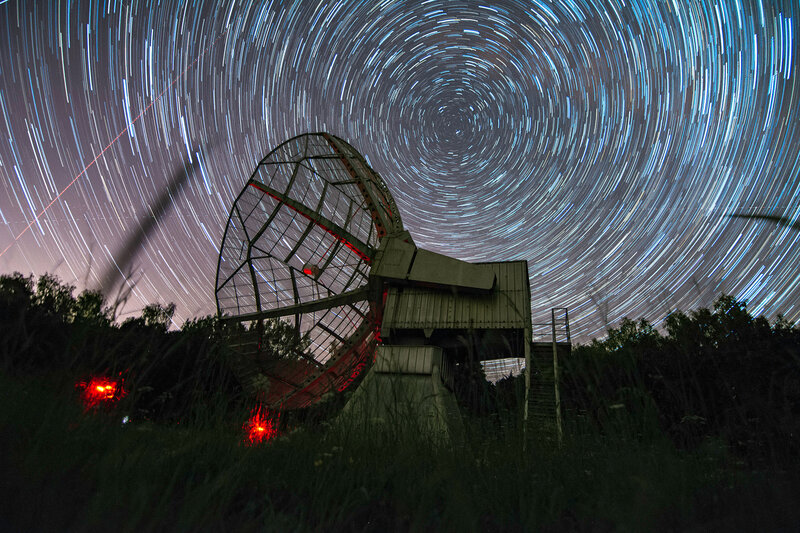 You can avoid capturing motion in your stars by using relatively short exposure times or special tracking gear that moves in line with the movement of the stars. 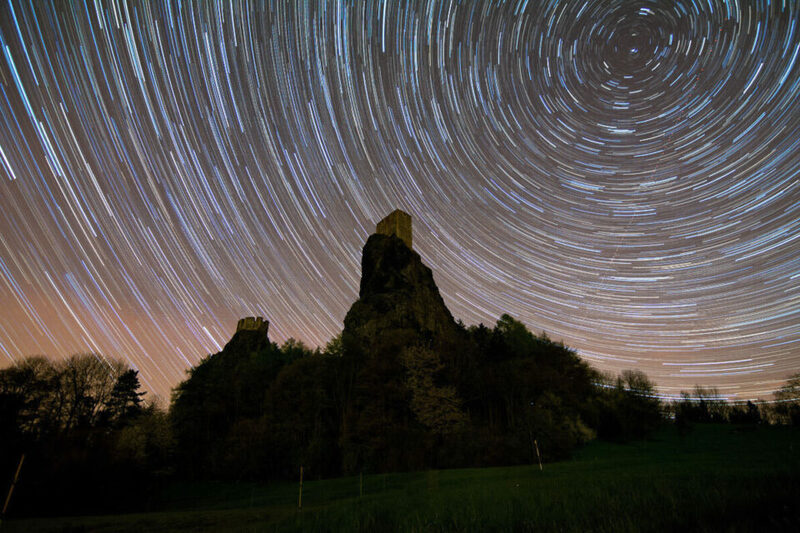 But if you want to photograph star trails, movement of the stars is not a concern – it is your goal! The concerns above still matter, although you have more flexibility than if you’re trying to capture sharp stars. You don’t need a tracking mount, and, while ISO performance is still important, you can get by with a more normal camera sensor with good results. The same holds about the lens; faster and wider is better, but even a kit lens will do. Movement of the stars is not a curse but the blessing. With a very long exposure (or, as covered below, several shorter exposures in sequence), you will use their movement to create the trails you want. The most challenging part about star trail photography is to know where to point your camera and what settings to use in order to capture the motion you want. That is where this article will help out. Any DSLR, any mirrorless body, or even an advanced point-and-shoot camera. 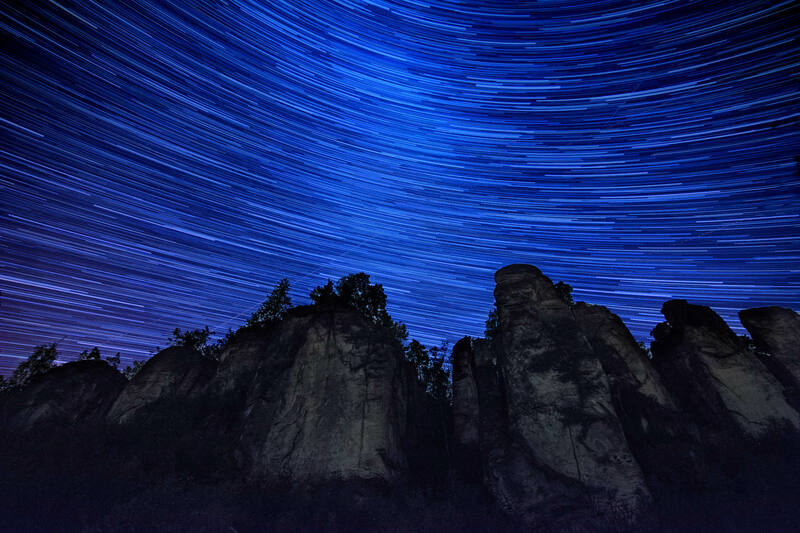 The bigger the sensor size, the better, but even an advanced point-and-shoot camera will be able to capture star trails, provided that it has manual mode. The smallest recommended sensor size is in my opinion an 1 inch sensor (such as Nikon 1 system, Sony RX 100 series). A cell phone will not yield good results (in my opinion, please prove me wrong if you have other experience), a cheap point and shoot camera either. Tripod: the sturdier the better, but again, with the exception of photographing in very windy conditions, you can still take good star trail photos with a less expensive tripod. Wide-angle lens: The rule of thumb is that wider and faster lenses are better (since you capture more stars). Fast lenses tend to be expensive, though, so you’ll be happy to hear that even cheaper lenses will do. In other words, a focal length of 18mm for APS-C mirrors with f/3.5 or even f/4.5 will be enough – which means that an ordinary 18-55mm kit lens will serve you well. Remote Trigger: For super-long exposures, you’ll want an external remote with a bulb mode that can lock down fully, or a camera with a “time” exposure mode that lets you use any shutter speed without a problem (and without holding down the shutter button the entire time). For a series of shorter exposures, you can use a remote trigger with an intervalometer or a camera with a time-lapse function. Sufficient memory card capacity and a fully charged batteries in the camera. Take a spare battery with you. Headlamp: recommended for easier manipulation in darkness, ideally with a red diode that does not shine too much and harm your night vision. Computer or laptop: A small tablet is not powerful enough. You’ll also want good image editing software; I recommend a combination of Adobe Lightroom and Photoshop for this situation. You need a clear night sky without any clouds (this is key) and without massive light pollution in order to take the highest quality star trail photos. Unlike taking pictures of the Milky Way without any star movement, it is not necessary to pay extra attention to the moon phase when shooting star trails. Even with a full moon, stars can be seen in the sky – only relatively few (the moon is outshining most of them). The closer to the full moon, the fewer the stars there will be. When it is a new moon, you will see a greater number of tiny little stars, and you can photograph them so long as you have the right equipment. Still, if the moon is in the sky for star trail photos, keep it away from appearing in your frame. Otherwise, you will have a big, overblown blob in your frame, and it will most likely ruin your composition. Sometimes, a camera lets you photograph phenomena that are invisible to our eyes. Star trail photography is such an example. That is the intriguing part: You can enjoy seeing something on the photo that you cannot see with your eyes. 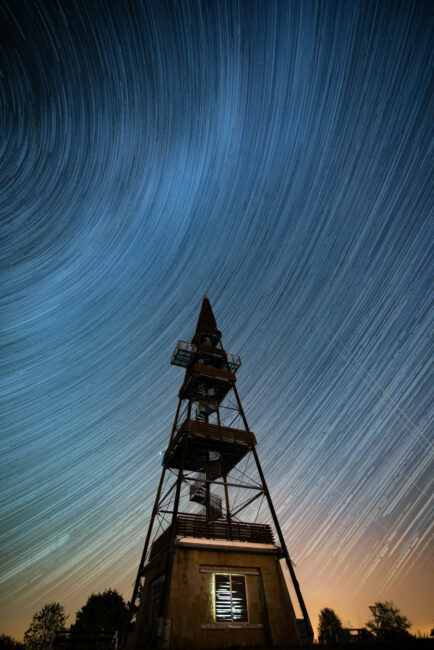 From purely photographic point of view, star trails are often circular in shape, which happens to be a very strong element of composition in most photographs. 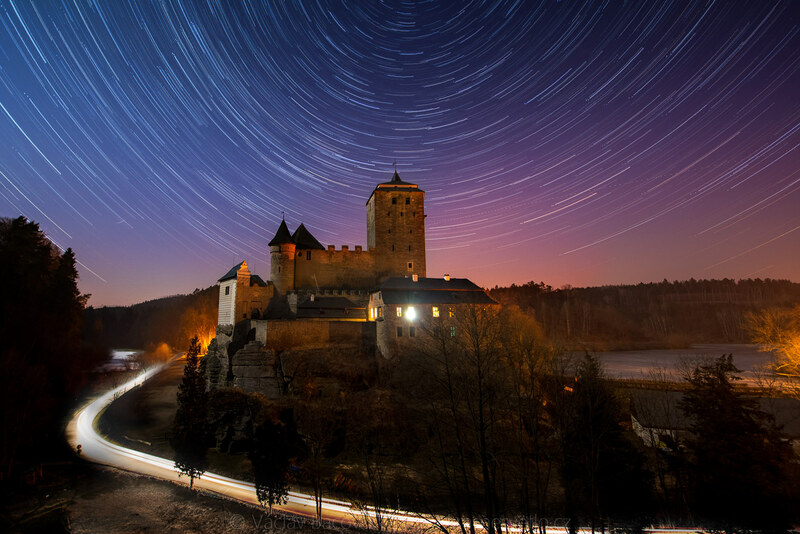 So, it is very possible to achieve attractive compositions, as the star-trails provide for a natural main motif in the composition of your photograph. Still, I recommend that you put just as much thought into how the foreground complements your sky if you want to capture the best possible photo. The distinct (mostly circular) shape of the stars trails result from the rotation of the Earth’s around its axis. The Earth’s rotational axis goes from the south to the north pole through the globe. Above the northern pole, at a certain altitude in the zodiac, this axis touches a certain imaginary point in the sky (celestial pole). It happens to be near the Polaris star in the Northern Hemisphere. So, from our perspective, this is the star which all the others appear to rotate around. It is very useful to be able to tell where the Polaris star is located on the night sky (beware, Polaris is not the brightest star in the nighttime sky, as is commonly believed). There is a relatively easy way how to find it: locate the well-known Big Dipper constellation (also known as Ursa Major or “Plough” in the U.K.). Draw a line from pointer stars (called Dubhe and Merak) that outline the outer part of the Big Dipper’s bowl. This line leads directly to Polaris (at about five times the Merak/Dubhe distance). Polaris marks the end of the Handle of the Little Dipper. In south pole, there is similar way to find southern celestial pole by knowing the Southern Cross constellation, although this one takes a bit more effort; you can read a tutorial here. However, knowing the star constellation is not essential. 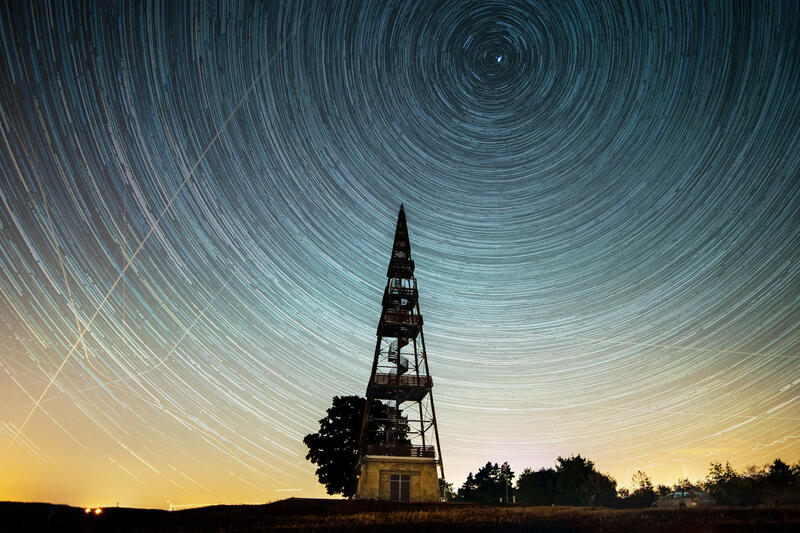 You should know that nice star trails can be created with a view of any part of the sky. It is only if you want a series of circles that you should focus on the north or south celestial poles. Or, similarly, during the Equinox days on the Equator, it is possible to get semi-circles on both the northern and southern horizons at the same time. Scout the location: Come early, ideally before sunset. If you arrive late in the darkness, do not overlook your safety, especially in places where dangerous wildlife may occur, or where you stand on some steep rocks or cliffs. Cloud evaluation: If there are more clouds than you would have expected, check available weather radars and consider whether the situation is likely to improve or worsen. 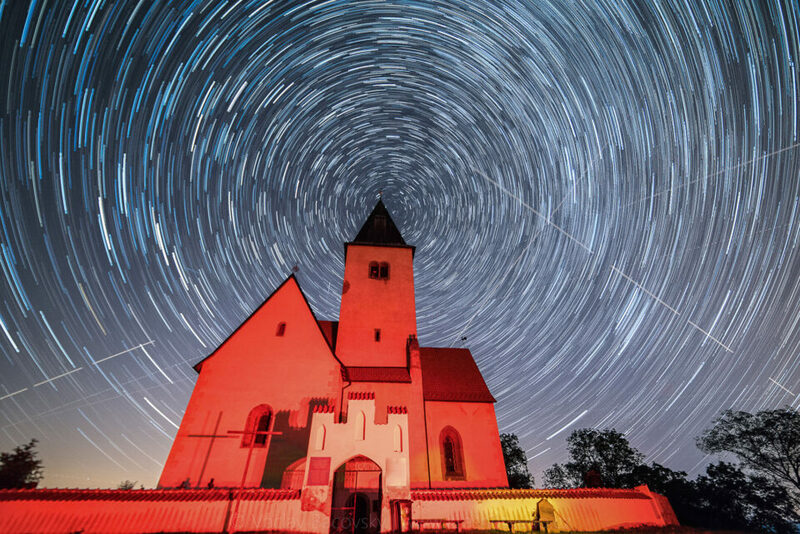 Clouds can harm a star trail image significantly – although, if you took several shorter exposures to combine into one final composite, keep in mind that clouds can still look good in the time-lapse version of your images. Orientation on the night sky: Where are north and south? If you’re in the Northern Hemisphere, can you spot Polaris? Can you see the Milky Way? Can you use the compass of your mobile phone, or are you able to read maps precisely? Do you know where the moon is going to rise or set? The answer to these questions can help you find the right orientation for your photo even in complete darkness. I recommend thoroughly preparing at home by using desktop programs such as Google Earth, Stellarium, the Photographer’s Ephemeris, or various other mobile applications such as PhotoPills. Framing the photo: How does your composition look? Do you want to have the circle in the photo, and, if so, is it symmetrical or off to the side? How much of the foreground are you including? Based on these questions, choose the appropriate lens, zoom to the right focal length, and acquire focus (see more details below). Proper focusing and exposure tuning: See below in more detail. Battery and storage: Double check if your battery is full and if your card has enough capacity. Starting the exposure: Be aware of the launch time and calculate the ideal finish time. Find a good (warm) place where you can wait for the long exposure to be completed. Final steps: Once home, start your post-production process. Manual mode: This is crucial – always use the full manual mode. Semi-automatic modes (aperture or shutter priority) will not work reliably (regardless of the exposure metering settings). You have to set the aperture, shutter, and ISO by yourself. See the chapter below for exposure details. Auto-ISO off. It is important to disable the Auto ISO feature if your camera has it, or your decision to shoot all manual is for nothing. Dark-frame subtraction (long exposure noise reduction) turned OFF. 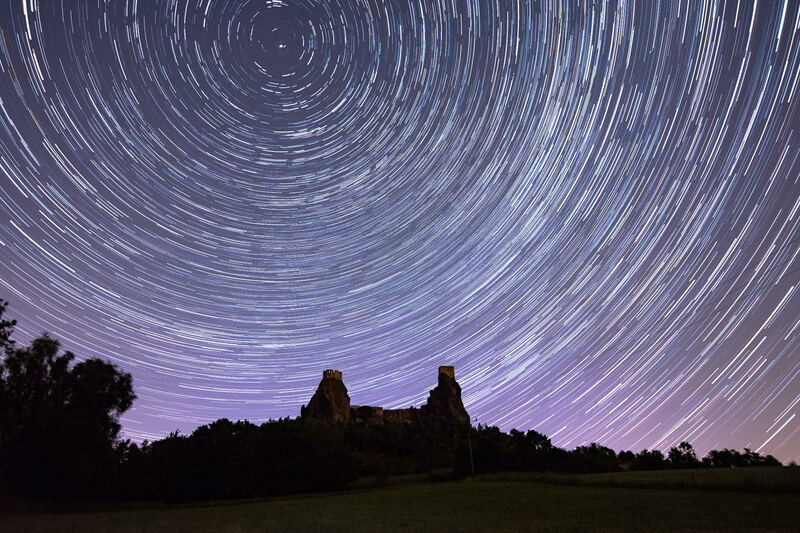 This is essential if you are taking a series of photos to combine into a single star trails image. If this function is turned ON, the camera will take one more exposure after each long exposure (of the same duration) with the shutter shut down, so that a dark frame (black frame) is produced, where only the pattern of noise is visible. Although the camera can subtract out some of the noise from the initial long exposure, it is a bad idea to leave this ON for star trail photos. The extra time needed for a dark frame would result in gaps in the trails. Unless a dashed line is your aim, this feature is not desirable! Lens stabilization OFF. After you set up your camera on the tripod, do not forget to switch the stabilisation off. Image quality: RAW. If you have enough space on the memory card, always shoot in RAW. If your camera has only the JPEG option, choose the highest quality and resolution. If you can shoot in JPEG only, make sure the White Balance temperature is somewhere between 4000-5500K; in RAW, though, you can correct white balance later without issue. Focus: Using the AF-S if there are bright enough objects to focus on, or manual mode in combination with live-view in darker conditions (see “challenge 1” below). Exposure: Depends upon the phase of the moon – see “challenge 2” below. Focusing in almost complete darkness is the biggest challenge, as the focusing process is always dependent on the amount of light. The less light you have, the less reliable the automatic focusing is. I recommend you know your camera and lenses well, especially how to focus manually before you head into the darkness. That includes knowing where you can find the focusing and stabilisation buttons. Keep in mind that you can “pre-set” your focus for infinity during the day and then keep it unchanged until the night. But that presupposes that you know your focal length and composition in advance. Since that is most likely not the case, let me tell you two ways how to acquire focus at night. We also have a full article on acquiring focus for star photography if you want more tips. In the first case, the source of light can be almost anything: a street lamp, a lit window, or the moon. It can be your friend going a bit farther away with his headlamp light on. Anything that is bright (relative to the darkness around) and does not move too quickly (passing cars are not useful) will help. The brighter the source and the farther, the better. If it is bright enough, autofocus may be able to acquire sharp focus on your subject. If so, always use the center focusing point; it is the most precise one. Otherwise, you may need to focus manually by magnifying your image in live view and carefully changing the manual focus ring on your lens until the object is as sharp as possible. It is important that your source of light is far enough away so that you are as close as possible to “infinity” focus. With wide angle lenses, any source farther than 8-15 meters will work well. As soon as you acquire focus, disable the autofocus by switching the dial on the lens to manual mode. Make sure it is impossible for the camera to start autofocusing, or it will mess up your precision focus! In this case, I focused on the bright light on the building. In the second case, you are in a tough situation. The only light source are stars, so you will have to use one of them to acquire focus. Here, your only choice is to switch to manual focusing mode. Most of lenses today can focus beyond infinity, so you unfortunately cannot just turn the lens to the farthest focusing distance. At the same time, even if your lens has an infinity symbol on the distance scale, it is likely to be too large, so you cannot really be sure that the ring is set to the right position. But I still recommend putting the focusing ring to the middle of the infinity sign as the starting position for manual tweaking. Use Live View, select the highest possible ISO (no worries about noise, you use it just for focusing) and the most open aperture (lowest f number possible). Do not forget that your lens focal length should be set on the desired value. You should not re-zoom after this point, or your focusing process will have to be repeated. Then look for stars on the display. Depending on the focal length, the stars might be too tiny. If you do not see any, use display magnification. As soon as you think you see a bright spot, zoom in the live view (not with the lens!) perhaps as far as to 1:1 magnification. Then, you have to test whether what you saw is a star or just a bright pixel, also known as a hot pixel. Move the focusing ring very slightly – just a ted in either direction. If the borders do not change in size (getting blurry and less blurry once you change the direction of focusing), you see a hot pixel. If the spot does change in size, you are looking at a star or planet, which is your goal. Personally, identifying a star sometimes takes me even several minutes, so be patient. There were no bright lights to focus on for this photo, so I had to use the method above to focus directly on the stars. After as you nailed the focus, you need to set the ISO back to the ideal value (more on that below) given the conditions. Also, try to remember the position of the focusing ring (if your lens has the scale) – it will come handy next time you do night photography. Be careful not to rotate any of the rings on your lens, or you will have to repeat the entire process. Focus stacking might be needed if your foreground is relatively close and if want to have both sharp star trials and the foreground. Do the foreground focused photo first, then proceed with the star photos. Take a look at our article on getting enough depth of field for star photography, where we cover it more in depth. If you feel intimidated by the growing complexity of the process, keep in mind that sharpness of the foreground element might be more important than the sharpness of the star-trails (these are “only” lines anyway, by having them less sharp they will “only” get slightly thicker). On the other hand, you need only one sharp in-focus photo of the foreground, and focusing on it is relatively easy even in total darkness as you can use your headlamp to lighten it while acquiring focus. Let us start with an easier task now: Choosing your aperture. Unlike with Milky Way photography where you want sharp stars, the aperture setting is not as crucial. Choose anything between f/2.8 – f/5.6, depending how fast your lens is, how sharp the lens is, how much near foreground you have (in which case a closed aperture will help you retain enough depth of field). How long of an exposure is long enough? How much time should your exposure be if you want to get a circular shape in the image? Intuition tells us that we need a very long time of shutter speed (time when the shutter is open). In theory, to get a perfect star-trail photo where each single star paints a full circle, the earth would have to complete a full turn during the exposition. But wait, the full turn of the earth takes… yes, it takes 24 hours! Luckily, there is no need to expose for so long. Besides, exposing the night sky for 24 hours is impossible anyway, unless you’re taking pictures during winter in the Arctic or Antarctica. 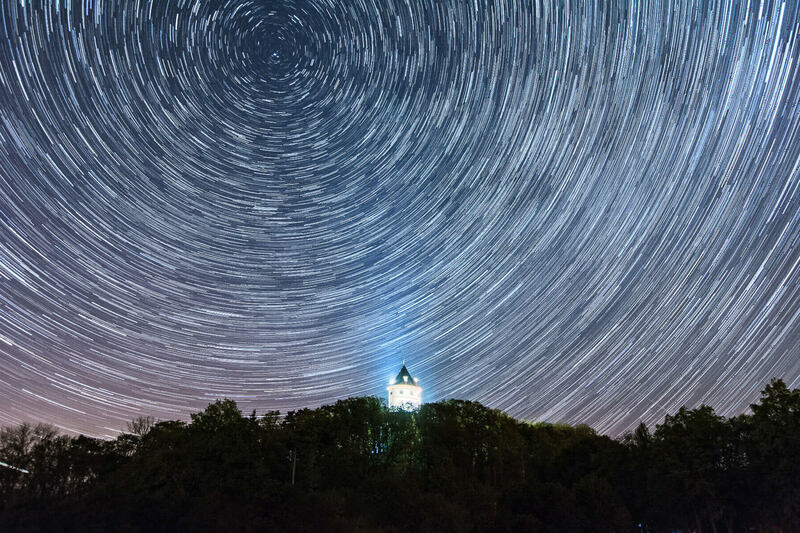 Since the number of stars in the sky is high enough, and their imaginary circular paths overlap, the illusion of circular star trails will occur with far shorter exposures. Still, 60-90 minutes is the minimum time I recommend to expose in order to capture very clear star trails. If the exposure is longer, the circle will be somewhat fuller and more complete, but, for a good impression, you should be well off with something in the range of 90-120 minutes. Also keep in mind: The wider the focal length is, the more time you need for the circular illusion (and vice versa: you need relatively less time for long focal lengths). When aiming at an extremely long exposures, theoretically there are two options: either one super long exposure, or taking several partial exposures that are later blended together and overlapped in post-processing (which practically means that you are adding times of each single exposure together). The single long exposure may seem simpler, and it is perhaps feasible with film cameras, but it is impractical for digital photography for several reasons. First, imagine that you wait for one exposure for an hour and only then realize that your focus or exposure is not right. Often, the foreground (landscape) is more illuminated than the sky, even if our eyes do not recognize it at first glance. After a very long exposure you may find out that the sky is exposed properly, but the foreground is completely burned out. In addition, the intensity of illumination is often inconsistent (e.g. due to some traffic). A single passing car at the end of hour long exposure may thwart the whole process. Frustrating, right? But that is not even the main problem. In digital photography, noise is the biggest enemy. Say that the proper exposure for one single shot during a new moon is something like 64 minutes, f/5.6, and ISO 100 (which is equivalent in brightness to 30 seconds at f/2.8 at ISO 3200). Even then, you should not expect to get low noise level due to base ISO. As soon as the sensor is exposed for longer than a few minutes, it starts severely overheating. The heat leads to false signal, which results in noise. That is why a single super-long exposure is not suitable for star trail photography, leaving aside special camera setups with cooling systems. Therefore, I recommend the second method: stacking shorter exposure times together. In this case, you cannot get the final image in the camera; you will need to post-process the photos and composite them (stack them) into the final image. Although this method takes more time, it allows much more control and leverage in post-processing. As a bonus, you can also later use the single frames to create a motion picture (a time-lapse video or GIF animation). Theoretically, what matters is the total added time, not the individual number of photos you take. So, it should not matter whether you make 100 exposures of 30 seconds each, 50 exposures of 60 seconds each, or 3000 exposures of one second each. The total length of exposures is identical, and the resulting photo will be essentially the same. Practically, though, it makes sense to make the number of exposures smaller if possible, since that prolongs the lifespan of your camera (shutter actuation). Moreover, you make the post-processing step less demanding for your computer by using fewer source photos, and you also save a lot of storage space. If you lens doesn’t allow an aperture of f/2.8, adjust the ISO to compensate, such as 30 seconds, f/4, and ISO 6400. Or, if you don’t want to raise the ISO, you can keep it at the same level. The sky will be less colourful and darker, with not as many visible stars, but you can still get a good image as a result. The situation changes with full moon, since the light intensity of the sky is about 4-5 EV brighter than a sky with stars alone. Do not overthink this, though. I recommend trial and error method. Make sure that your exposure includes enough stars that you are satisfied, and that your foreground is the proper brightness – not overexposed or underexposed. This is something you can double check with the histogram, although note that at night it is normal to have a very dark histogram. Use a remote trigger (wireless or wired) that has a lock on it (that is, the effect of a permanently pushed trigger). Select continuous shooting on the camera. Once you press down the shutter button on the external remote and lock it, the camera begins to shoot a series of photos with minimal delay between exposures. It keeps shooting as long as the trigger is pressed and locked. If you do not turn it off, the camera will only stop when the card is full or the battery is empty, so be sure to set a timer on your phone to remind you when to stop the exposure manually. Now that your card is filled with dozens or even hundreds of night photos, it is time to post-process them. I recommend using a software that allows batch processing (such as Lightroom, Photoshop, Zoner Studio, and so on). The first step is to tweak the very first image in your sequence. Fine tune the color temperature, adjust the shadows and highlights, and so on. You may want to add clarity or perform some noise reduction, too; it is up to your personal taste. Then, select all your images and apply these adjustments as a batch to every single photo. Keep an eye if there is any outlier in your sequence, such as a photo affected by passing cars. Consider removing it from the rest of the group. Then, consider the computational power of your computer and think about your intended use for the final output. It is very demanding on the RAM capacity and processing power of your CPU and graphics card (and even storage) to merge a set of photos like this, particularly if you are using original RAW photos to do so. Personally, I do not stack the edited RAW files; I export the RAW files into JPEGs. I may even resize them if I know I am not going to print the final result, but use it only for the web or social media. At this point, you need to stack the photos. Personally, I load all the files into Photoshop under File > Scripts > Statistics. Then, you can tell Photoshop to stack the images using the “maximum” method. That effectively compares each photo to the next one and keeps pixels that are changing. This results in the growth of star trails. There is drawback though: this method also highlights noise in the image (which is random and hence different photo from photo), harming the foreground significantly. For that reason, I recommend copying the stacked layer once again and applying a different stacking method – mean or median. This layer will then be very clean with hardly any noise, but also without any stars (or only faint hints of star-trails). You can then blend both layers by masking them or by using different layer blending options (such as screen or overlay in photoshop). I use both layer blending and masking. Note that specialized astrophotography software can deal with this tradeoff by extracting the stars out of the image and working only with the bright stars to maximize their trails and minimize noise. However, even the method outlined above can give you very high quality images. If you are happy with the final result and you do not want to change it later, you can flatten the image and have the final result. If you want to edit the stacked image later, you should save it as TIFF or PSD file (but this is not recommended in most cases, since the size of the file will be huge – likely several gigabytes). In this article, I tried to explain how to take high-quality star trail photos both in the field and in post-processing, particularly using the method of stacking several photos across a long time interval. Even if the process seems difficult on paper, it is the sort of thing that becomes much easier with practice. The most challenging part is planning the composition without being able to see the star rotation yourself in the field, but that is something that you will become better at visualizing over time. While focusing should be as accurate as possible, exposure differences are ok, some imprecisions can be made up for later in post-processing. Star trails are more forgiving than photos with the Milky Way as sharp as possible. Plus, the learning curve of star trail photography is very quick. Do not get discouraged if your first attempts are not “stellar” yet. I only got good results on my third or fourth attempt. Ever since then, the process feels very automatic. I hope you feel inspired to try it on your own. Watch out for the clear dark sky, and have fun capturing the mesmerizing abundance of bright stars in the universe. Ever since i bought my first full frame camera nearly a year ago i never had the chance to shoot any kind of astrophotography because the weather gives me a big middle finger, unless i spent a lot on travel and visit other places or countries. I live in a hot and humid tropical country so we have lots of clouds, and almost half of the year is rain season. For my case luck with weather alone is more important than anything else at this point. Yeah, tropical climate is quite challenging in this aspect, I guess, at least that was my experience in Hawaii several years ago – at ocean coast I never had luck for a single clear night. If you shoot direction south (on the northern hemisphere) the stars trail to an arch which is very harmonic (in my personal taste). But a bright milky way which is probably visible in summer nights is quite distracting. The height/angle of polaris (so the “rotating” point of the stars) depends on the degree of latitude. Norther latitudes will result in a very high polaris. Images with it in the frame are quite difficult (with a decent composition). I make several shots for the foreground in the blue hour just before taking the star trail shots. My default camera settings are (with a new moon): ISO 800, f5.6, 4 minute exposure. My Canon 700D (battery) dies after 30-40 frames. A recent test with my Fuji X-T20 results in 40-50 frames although it is mirrorless. Hi Jens, thanks for the additional remarks – they are very accurate and useful. I wonder – don’t you spot any additional noise during 4 minutes exposures due to overheating? 1. If you want to eliminate meteorite trails/planes (though they can certainly add to the composition if done well), the best route is to use Photoshop. Import straight from Lightroom to Photoshop by selecting multiple images in LR, then clicking “Open as Layers in Photoshop.” Once they’ve all been imported to Photoshop, start stacking by using Photoshop’s “Lighten” filter, one layer at a time. When you get to a layer with the shooting star/plane you want to get rid of, simply paint it out with a black brush and continue stacking. Photoshop will continue using the brightest points to make your trails and you’ll be rid of the extras! 2. To get a sharp, properly exposed foreground, do everything as stated in the article, but take one (or more) additional shots either before or after the star-trail sequence. Then import this shot into PS as a layer like listed above. After you’ve stacked your trails to where you want them, erase the sky portion of your foreground shot, and use the “Auto-Merge” function to merge the star-trail layer and the foreground layer. You’ll end up with perfect star trails and a well-focused, properly-exposed foreground in one shot! I recently did a shot with yellow aspens on a windy night in Colorado, which of course made the leaves blur on long exposures. However, I did one shot before my interval sequence (45 30sec. exposures at 15mm, f/2.8) in which I actually used an off-camera flash set at wide-angle 24mm and a lower ISO. This froze the aspen leaves, but still allowed me to have the star-trailing sky above the trees. 3. With modern software and given we are trying to make trails instead of pin-sharp stars, don’t be afraid to use whatever lens you have in your stable. For example, if there is a far-off peak or rock formation you want to compose around, use your telephoto lens wide-open and stack for several hours worth of exposures. You won’t have as many, or as bright, trails as with a wide-angle, but your composition will be better than having your point-of-interest lost in the background of a wide-angle shot. Don’t ever let your equipment stifle your creativity, there are great shots out there whether you’re using $15000 or $500 worth of equipment. 4. For crop-sensor shooters, I’ve had a great experience with the new Irix 15mm f/2.4 lens. On my d7200 I get great results at ISO 3200, f/2.8, or even ISO 6400 f/3.2. I’ve also used the Tokina 11-16 f/2.8 (used in the article) which does great with trails. That lens is tougher for Milky Way shots as the corners aren’t very sharp wide-open, but your mileage may vary. Gabriel, thank you for your tips – they are great and very much appreciated. I was actually thinking of cleaning some of my star-trails compositions (getting rid of air-plane-trails) and I find your procedure very appropriate. So thanks again! V.
Thanks Václav for a comprehensive guide, and thanks all commentators for further useful tips. As the hours of darkness get longer here in latitude 55 degrees N I’m looking forward to my first attempts in this field. Other writers have mentioned condensation as a problem for long exposures in our cooler climate, and I wonder what your comments are on this, Václav? Hi Gerry, I had no issues so far but that is mostly due to three facts: 1) I usually collect images around midnight when the temperature does not drop that quickly yet. 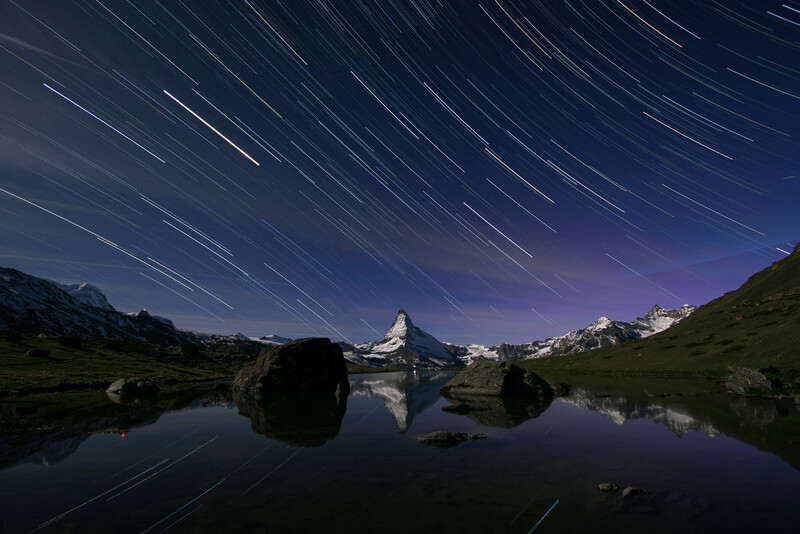 2) I did not try star trail stacking in the high mountains (except with the Matterhorn – but there my battery died after less then one hour) or in very humid places. 3) I did not do extra long (above two hours) expositions where I think this problem is more likely. I’d been looking online for a few tutorials for star trail photography but I have to say, none as comprehensive and thorough as this one. Extremely well written and pretty much answers also all of the doubts and questions I had regarding various methods to expose and also to post-process for this kind of photography as well. Václav to the rescue, once again, and with some impressive pics to boot. Díky moc! I got some good results with focusing on very bright stars (Sirius, Jupiter, Mars this year) but if your camera cannot do it, than use a flashlight pointing towards you in a decent distance. As you wrote, 10m is okay for a wideangle glass. Although you warned not to zoom your lens once focal point is achieved, I would like to stress this could be a very important point: Some lenses will have different “infinity point” for different angles (18mm / 24mm / 35mm / 70mm). And you could touch your focus ring by mistake. 1) Most intervalometers (like the ones built into Nikon internally, and the cheaper external models like Vello) use an interval or gap that is start to start of exposure, NOT the gap in between exposures. Thus if your exposure is set to 30 seconds, you need your interval set to 1 to 3 seconds longer than your shutter speed, i.e. 31 to 33 seconds. On an external intervalometer that can be set to infinity for the number of shots, this doesn’t matter as much. But if you are using the built-in intervalometer of a Nikon, it means you are burning through your limited set of exposures very fast (if for example your model only supports a max of 999 images instead of 9999); with an interval of 1 second you have burned through 999 trigger commands in only 17 minutes! And with 30 second exposures, that means a max of ~34 images and you’ll wonder why you never got enough. ;-) Also, many Nikons need 3 or 4 seconds longer than your longest shutter speed or you will skip some frames and get gaps in trails, even with a fast memory card. The CPU is just too busy doing other tasks. This is not a problem with an external remote however. 2) Historically Nikon cameras have always been limited to 100 to 200 maximum frames (depending on the model) in continuous release mode with a single shutter press. So the Canon trick of just locking the shutter button on an external intervalometer won’t give you a very long timelapse without programming the intervalometer to send a separate shutter command every x seconds. However, the Nikon D850 is an exception to this and has no limit to the number of photos in a single burst as long as the shutter speed is 4 seconds or longer and the exposure mode is set to S or M. It will run until the battery dies or the memory card fills. StarStaX (Windows, Mac, and Linux) is a great free program for stacking. Much faster than Photoshop. The only drawback is that while it can read 16-bit TIFFs, it can only save an 8-bit TIFF or JPEG, so it’s better to just stick with 8-bit TIFFs for input. It’s really, really fast though and supports nice features like gap filling and comet trails. My favorite stacking “app” is actually a plugin for Photoshop though: Advanced Stacker PLUS by Star Circle Academy. It’s slower than StarStaX, but supports 16-bit being a Photoshop plugin, and is still very efficient because it only loads 5 or so frames at a time where stacking via Photoshop alone requires a tremendous amount of memory for hundreds of 36-50MP images. Advanced Stacker PLUS also supports comet trails and other cool methods of stacking. Hey Aaron,thanks so much for giving us your precious advice. I really appreciate you explained the issue with Nikon intervalometers, I could not believe the functionality would be this bad and hence looked for some other reason why I cannot take more than cca 34 images with time lapse. I calculated that it corresponds to 999 seconds, but I still could not believe this is the way Nikon wants us to use the time-lapse intervalometer. Now it is confirmed that it is pretty useless for star-trails astrophotography. You are also right that I never managed to get more than 200 images with the locked remote trigger, so that is another bummer. I will definitely try StarStaX, really curious how it works.